St Pauls Cathedral in London -an amazing church / cathedral. 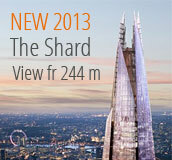 Address: St Paul's Churchyard, Cannon Street, London. 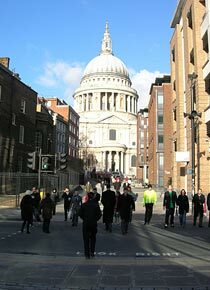 Located between the streets of St. Paul's Church Yard and Paternoster Square. 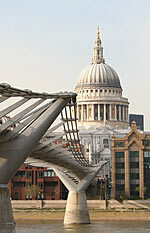 You can not miss it if you have gone over the Millennium Bridge. For those of you who like churches and cathedrals, do not miss a visit to this amazing building. It has in fact been three cathedrals here before, at the same place as you now find St. Pauls Cathedral. The decor is absolutely stunning with mosaics which is mixed with ornate stone. Today you can see the fourth cathedral that was completed in 1710. It took 35 years to build the Cathedral. The architect is Sir Christopher Wren. He was assigned to build a magnificent building and for that, he studied buildings in Europe among others Peters Church in Rome. The Church is designed as a Latin cross if you look at the building from above. About 39 meters long and 30 meters wide. In the center of the church is a large circular area with eight pillars bearing the dome. The top/dome of the church is located about 112 meters above the ground. 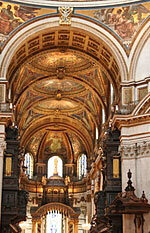 St. Paul's Cathedral is northern Europe's biggest church and the second largest cathedral in the world. Inside the church there are several different church bells - the heaviest called Paul the Great, and weighs about 17 tons. The church is now used as the residence of the Anglican Bishop of London. Inside the cathedral you find a library, a cafe, a crypt and several galleries. One of the most famous is "The Whispering Gallery". You can even use the Church for private events in truly amazing rooms. In the crypt there is also a café. The church is absolutely fantastic. Just walk around and watch this masterpiece. For those who dare and have the strenght, we think you should walk all the stairs up the dome and go outside. Up there you get fantastic views out over London. Then relax with a cup of coffee in their crypt. SAVE UP TO 10% when buying the tickets online compared on site. The ticket is open-dated and can be used any time within a year, when open. See info on your booking voucher. The ticket includes admission and access to views outside the dome. St. Paul's Cathedral was hit during the "Blitz" in October 10, 1940 with a direct hit and was badly damaged on the inside. During the second big hit on April 16, 1941 - the cathedral managed good and therefore it has also become a symbol of survival. On the northern side outside the church you find a memorial stone of the 30.000 victims during the "Blitzen". Some important ceremonies which took place in the church are among others the funerals of Lord Nelson, as you see in the picture to the right, he died in the Battle of Trafalgar in 1805, the Duke of Wellington (won the Battle of Waterloo in 1815) and Sir Winston Churchill. What characterizes the people who are buried in the church is that it is mostly soldiers, painters and architects and not royalty, statesmen and authors that you find in Westminster Abbey. 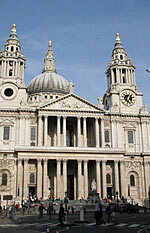 The architect who built St Paul's - Sir Christopher Wren is buried here, of course. Some other ceremonies was the wedding between the Prince of Wales and Lady Diana Spencer, 29 July 1981. Also the celebration of Her Majesty's 80th birtday, on 21 April 2006. If you like galleries and views and are not afraid of heights, we recommend that you walk the 378 steps up to "the Stone Gallery". 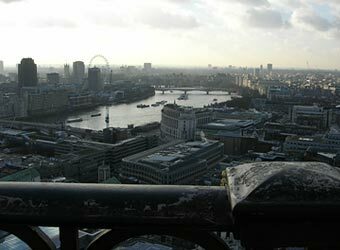 From here you can take great pictures of London. You move on to the outside of the cathedral. Belowe the Stone Gallery is "The Whispering Gallery", this goes around the inside of the cathedrals Dome. This is where you come after you have gone about 259 steps from the ground. The Gallery is known for its whispering eco sound. If you wisper against the wall you can hear it on the opposite side. You can also visit the "Golden Gallery"- when you go here, you go inside the cathedral and you can see Wren's magnificent work. Up to here it is approximately 530 steps. More people that are buried here is among others Florence Nightingale, the painters Sir Joshua Reynolds and Sir John Everett Millais, Sir Alexander Fleming, composer Sir Arthur Sullivan (Gilbert and Sullivan) and the sculptor Henry Moore. The inside of the cathedral is decorated by the famous artist Sir James Thornhill. 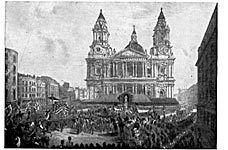 The picture shows the funeral of Wellington. 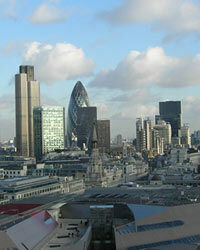 Around St. Paul's it is only about a 5 minut walk to the London Museum, Shakespeare's Globe and the Tate Modern. 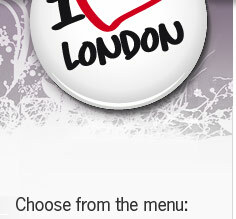 You can get here by subway on the District Line or Circle Line. Keep in mind that is it not allowed to take pictures or film inside the cathedral. But you can take photos when your are outside. Source: sv.wikipedia.org. Pictures: Wikipedia and own.